Easton, MD Christ Church, St. Peter’s Parish launched its 2012 Capital Campaign with a special evening of wine and cheese. 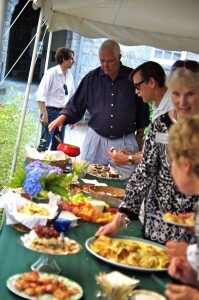 It was a magnificent evening for the outdoor event that featured fondue and delicious specialty deserts. Welcome! Renew! Rejoice! 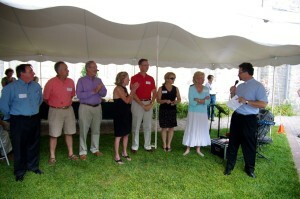 is the theme of the Capital Campaign, which held a Capital Campaign Celebration on the evening of June 25th. The cool breezes on a warm summer night drew more than 120 members of the congregation and their friends to the church campus where a tent was erected to host the celebrants. They were treated to a selection of wine, cheese fondue, a variety of fresh fruit and an assortment of cakes. Children were welcome to the event and special arrangements were made to ensure they enjoyed a festive evening of games and activities. The young ones feasted on pizza from their favorite pizzeria, the pepperoni was the first to go! The Reverend Bill Ortt, Rector of Christ Church, welcomed members of the congregation and led them in the campaign prayer. Thorough his prayer, Father Bill expressed his desire that through the Capital Campaign everyone may see that what was old is being made new; what was broken is being made whole, what was dead is being raised up and that all things are being made perfect through Jesus Christ our Lord. Campaign Chair Liz Freedlander, in her remarks, explained to the attentive crowd why it was necessary for Christ Church Easton to undertake a capital campaign at this time and how the campaign would be conducted. She reminded attendees that nearly five years had been spent studying the needs of Christ Church Easton and how best to address them. Liz emphasized the obligation members today have to the generations of worshipers who preceded them and to those who will follow. I know you agree, she stated,because you told us during the focus group meetings of your desire to maintain our church as the platform for our ministries. In a take-off of the Price Is Right, Emily Moody, Rector’s Warden and Ron McDonald, Co-chair for the Campaign’s Victory Phase, revealed the amount of funds already pledged to the Campaign. 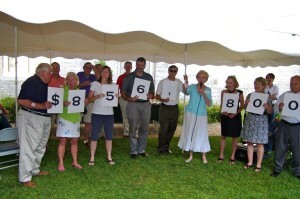 There was a collective gasp of delighted surprise from under the tent and across the lawn when Ron & Emily and their volunteers from the audience disclosed that a small number of Christ Church Parishioners had already pledged $856,800 in support of the campaign.